Millions of trees were uprooted, woodlands flattened, parks and gardens destroyed, the National Grid damaged, cars hit by falling branches and 18 people died. Places like Wakehurst Place, the Sussex outpost of the Royal Botanic Gardens (Kew) had lost some 60% of their tree collection as a result of the storm. In any given area, was it right to go for wholesale replanting ? There were lessons to be learned – for example, mixed stands of trees had fared better than those of similar age, as did trees with spreading root systems. 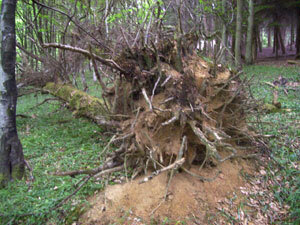 Places like Wakehurst decided to leave approximately one third of its devastated site to regenerate naturally. Some areas have been replanted with 2000+ specimen trees from around the world, whilst other areas have been planted up with 11,000 trees to acts as ‘buffer zones’ should another storm of similar magnitude occur. Wakehurst was not alone in this policy of allowing nature to take its course. The dead wood from the storm is now rotting and decomposing, open glades and clearings created by the storm are filling with foxgloves, brambles and woodland flowers; with time young trees will replace them. 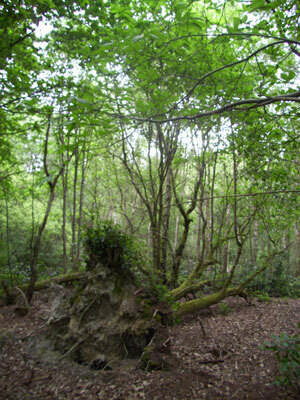 The Great Storm did great damage but it has also allowed regeneration and renewal in many woodlands – the opening of the canopy in many older woods has resulted in an increase in biodiversity - from saproxylic beetles to flowers of the herb layer. I was just a kid when this happened, but I still remember it well. I’ve been watching Hurricane Sandy YT videos recently. Storms seem to be occurring with increased regularity. How to grow a better tree.